In case you missed it, earlier this week FrozenByte released a PC demo for their upcoming three player co-op game Trine. We took the demo for a spin and we're happy to report the game is very co-op friendly, very beautiful, and best of all - very fun. The game starts out with a bit of a back story, fully narrated with some concept art style cut scenes. We hear of a land put in turmoil after a king dies without an heir. Soon magic turns from something that is used for good, to something that corrupts the land. It's at this point we begin to meet our cast of characters. First up is the thief. She's the more agile of the three, able to jump a bit higher, and use a grappling hook to swing and get to high ledges. Her main weapon is a bow and arrow. Soon her story is intertwined with that of a womanizing Wizard. Yes, a womanizing wizard. The wizard is capable of levitating certain objects, and is able to conjure small boxes. The wizard doesn't have any attacks per say - instead he can drop stuff on enemies and is used to manipulate the environment. Finally the Warrior's story intersects the Thief and Wizard. The rotund warrior is capable of smashing through wood, and attacking the undead with his sword and shield. He's the muscle of the operation. The single player allows you to switch on the fly between the characters as you maneuver through the environment. You'll need to combine the Wizard's ability to move platforms, manipulate weight, and conjuring objects with the Thief's agility to move on in the levels. Of course the Warrior plays a crucial role of defense during these puzzle solving times as well. So while the single player only has one of these characters on the screen at a time, the co-op lets players work through the environment together. If there are less than three co-op players, you either player can still cycle between the characters to help progress. Trine also supports drop-in / drop-out play; all you need to do is go to the menu and map a controller to a player number and the game drops them right into play! One interesting thing about the co-op is how multiple players can affect objects at the same time, adding a level of puzzle solving that's simply not available in single player. The only gripe I have so far with the co-op is that with it being only local co-op, the camera ties players together sometimes making it difficult to see and progress. 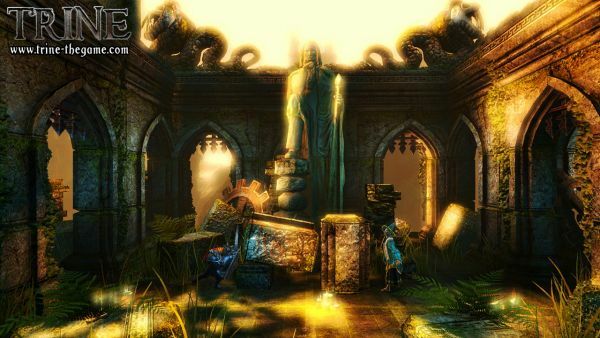 Trine is downright gorgeous in every aspect - the music, the graphics, and presentation. I was seriously bummed once the demo ended, I wanted more immediately. We'll have to wait till later this summer when it's released on the PC and PlayStation 3.